Hard to believe Easter is already over. Time sure can fly sometimes. Pierce found an Easter egg sandwich in his lunchbox. 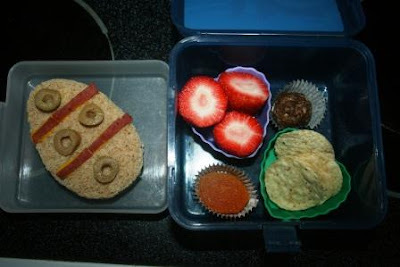 He had a cheese sandwich with mustard (and olive + sliced pepperoni for decoration), strawberries, an energy ball (see my post last Tuesday for a recipe link), dried apricots (Pierce and I both LOVE these! ), and some tortilla chips. Pierce ate every single thing in his lunchbox and didn't leave a crumb! Speaking of food (or, uh, drinks), have you all tried Sneaky Pete's yet? We were sent some to try (I was under no obligation to review it or anything) and I really like it! It has as much fiber as a bowl of oatmeal, but only 40 calories. And it isn't a really heavy taste like a protein drink (which I can't tolerate). My husband and Pierce really enjoyed them too. 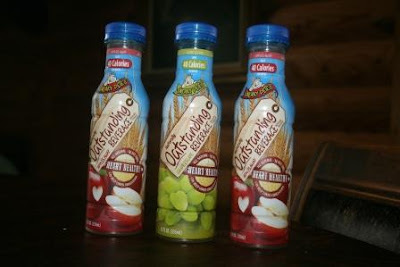 If you want to boost your fiber in a healthy drink, you might give it a try - they just hit the stores last month. Loving that easter egg sandwich. It is super cute! The egg turned out well, I like the effect the olives make. My girl Loves dried apricots, too! I really love your egg lunch! JDaniel would love the olives! Not even a crumb left? Oh my! I can't stand the taste of protein drinks either! What a cute idea... you're an awesome creative mom, the best kind! Protein and fiber in my diet is something I aim for and I might have to try Sneaky Pete's! Love the creative Easter Egg sandwich. Happy Monday Lisa. Super cute lunch! :> Hope you enjoyed your Easter! That sandwich is so cute--just like an egg! You are so creative. Thanks for the tip on Sneaky Pete's. With my stomach issues, I'll be looking for it in the store. I initially read the name as 'Stinky Pete'. Haha! Your creativity must drive the other Moms crazy! Never heard of Sneaky Pete's, but then again I don't get out much. What a great mom you are, making all those adorable snacks! The Easter Egg sandwich is awesome. I need to be more creative! Lovin' that Easter egg sandwich! Every week, I say it is my favorite but I do believe this has to be my absolute favorite! I love it! That is just way too cute Lisa! Love it! ohhhh, that lunch looks soooo yummmy! I can see why Pierce ate it all. It sure looks yummy! The drink sounds pretty good. I'll have to give it a try! Hi Lisa, YUM--that lunch that Pierce had looks delicious. I'm not surprised that he ate it all!!!!! Love the Easter Egg sandwich..
Haven't heard of those drinks. Will have to check them out.